I get it, you just don’t know if this is a forever thing or a right now thing. This relationship has been pretty awesome so far. He’s always been there for you and when times got rough, he didn’t waver and stayed strong. But there’s that sense of doubt in the back of your head that there might be something better out there for you so you start to weigh the pros and cons of the relationship. There are others out there that might be able to give you the same thing, but do they have these same qualities you are looking for in someone of worth? He’s consistent; you’ll give him that. There’s nothing that he does that makes you question his motives. When you need him, he’s always there. He’s accessible day or night at the push of a button, a text, or a quick message. You have so much in common. He also likes it when you stay in and watch shows together on the couch or you take a “me day” to work from home. He never judges especially when it comes to the shows you watch and when. The communication is excellent. When you need to talk, he’s always available to listen and helps you solve a problem only when you need it. With him, you just feel connected in every way. Yet, you still have doubts about commitment. Are you in this for the long term? Could this be “the one”? The moment we start to think that, many times reality sets in. There are hidden prices, faults start to show up, and the fear of committing long term suddenly becomes this cloud that hangs over your relationship. That's when you need to decide. Is this a right now thing or a forever thing? For those that fear this commitment, you don't have to make that choice because now, there is the Verizon FiOS PrePaid option. 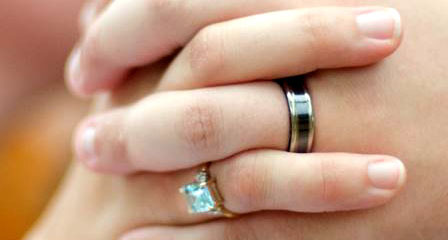 No credit check required to put a value on your union.There's no deposit required to put a ring on it. And there is no contract locking you in for a long term thing that you rushed into because there just when it comes to internet, TV, and phone and you've been hurt before. 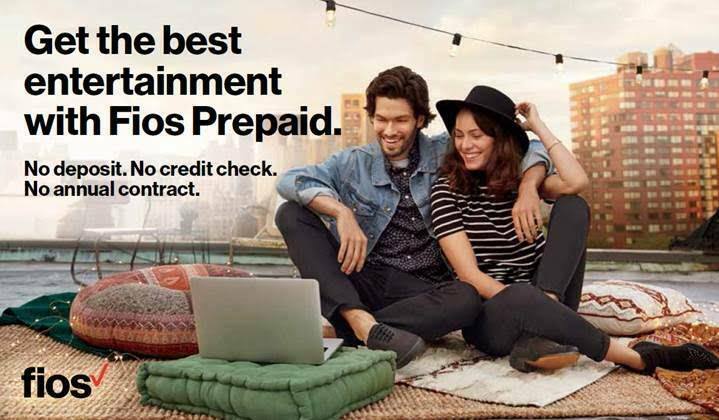 Verizon is backed by the world’s best network and customer service support. Access to the FiOS app lets you control your DVR from your phone and check up on the status of your account details. Pretty soon, you may feel like posting on social media that your relationship status has changed. Until then, Verizon FiOS will let you play the field until you decide that their toothbrush can take permanent residence in your apartment. Hey, Verizon FiOS understands that you need time to build something good together and they will wait for you. I remember the first time my son took the stage. He was playing the part of a clown in the summer program theater camp at a local middle school and he didn't seem that happy about his role. In fact, he was the saddest clown I ever saw. Despite that, he delivered his lines perfectly and his timing along with his physical comedy really sold the audience; so much so that I heard guffaws from the crowd. From then on, he was hooked on theater. His creative side resides in performance. Even growing up, we would spend hours upon hours of playtime dressing into different costumes and coming up with characters. He especially loved it when Daddy became Lobster Man who could only be thwarted by a fake stick of butter and a play lemon that would bring me back to my senses. Most kids love to play pretend, but my son really showed his true creative side when he wrote and performed an original play which sometimes didn't make all that much sense to most of the adults in the room but we applauded loudly anyway when the final curtain fell. In this play his lines were hilarious. His gags were innovative. And with a little help from dad his costumes were on point. I could see a look on his face that said "I'm meant to do this" That's when our star was born. Since then, he's taken part in plays at our local YMCA, taken after school acting and singing workshops and even starred in a major role as Judas in Godspell Jr. I had a moment of clarity when I heard this amazing voice singing the opening song called "Prepare Thee (The Way of the Lord)". It was my son. I never heard him sing it before and I was floored. Then he sang the most amazing rendition of "All For the Best" and I couldn't help but smile. He was meant for this. I'd like to say that I got him here but I'm just not the scheduler. The reason he was there in the first place is due to his mom. Always on the lookout for the best experiences there are for young actors, she has consistently found him ways to express himself creatively through acting, music, and song. 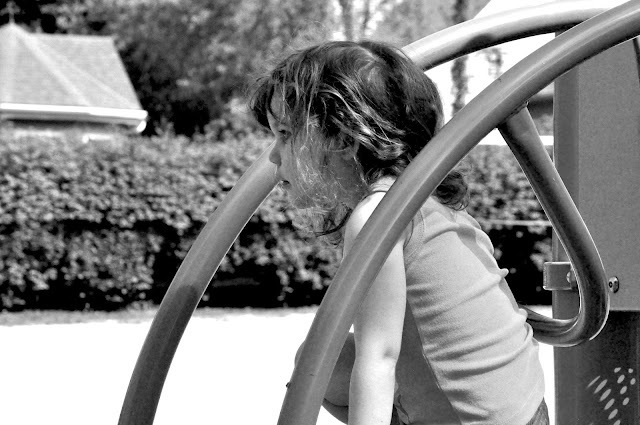 Parents, the arts are such an integral part to a child's development and can really help them flourish. 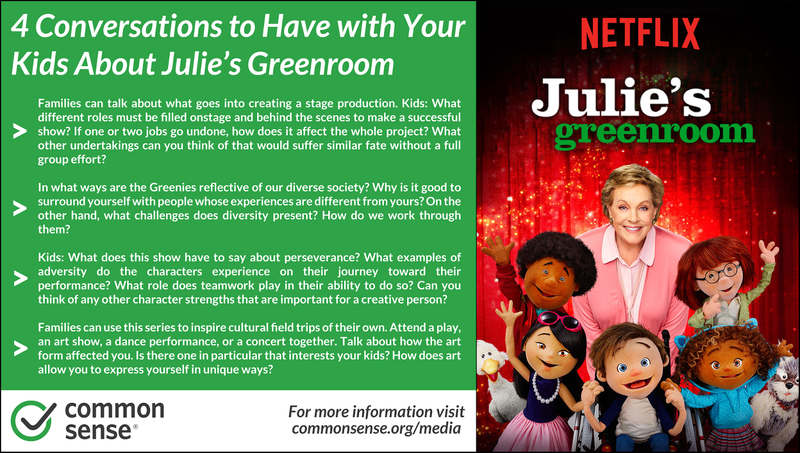 Shows like Julie’s Greenroom on Netflix are a prime example of what learning about creativity can mean to a child. In this show, Julie Andrews interacts with a cast of children, who are puppets, that learn everything it takes to be involved in the theater from lighting terms, to tech support, orchestra music and production. 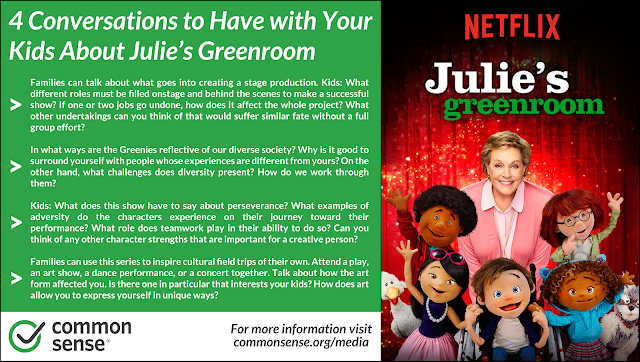 Kids will learn exactly what William Shakespeare has contributed to the English language and what kind of ghosts lurk around a ghost light on stage at night.Julie's Greenroom is the perfect way to show your kids that the performing arts are not only fun, but they can build character too. 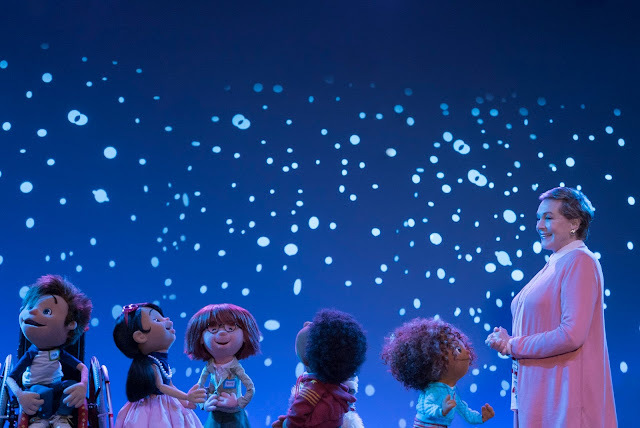 My favorite feature is to hear from current stars like Idina Menzel, Alec Baldwin, and Chris Colfer about what the performing arts meant to them as children. With brief bios on their own lives and just how young they started acting and performing, it has become an inspiration to my own children who were amazed to see what Elsa really looks like in flesh and blood. My kids are learning all about what it takes to write, perform, and act out a performance with the help of this show. So, we took inspiration from shows that promote music, art, and theater like The Beat Bugs, Ask The Story Bots and Julie’s Greenroom to create our own characters of Kip, Peri, and Walter as sock puppets. 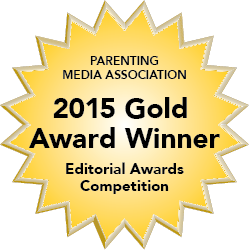 The resulting process is a performance we like to call, The Kangaroo and the Slug, written, performed, and produced by my three talented kids. 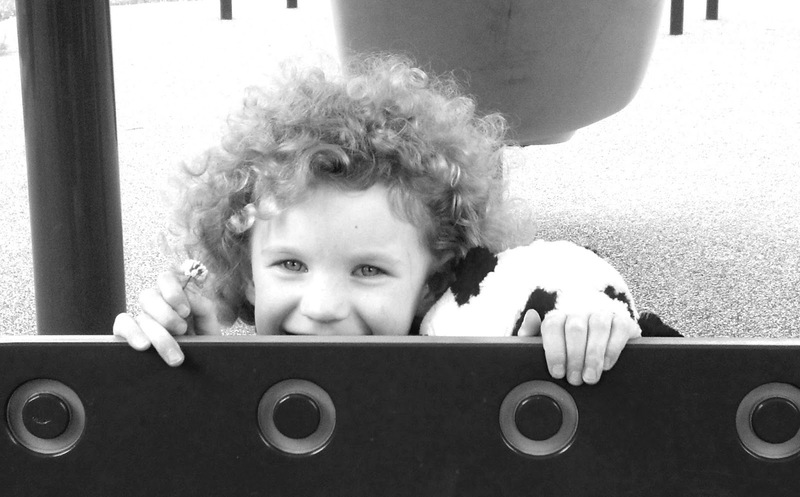 Want to get your kids involved in the performing arts? Use the prompts below from Common Sense Media to get started with your kids and get creative together. 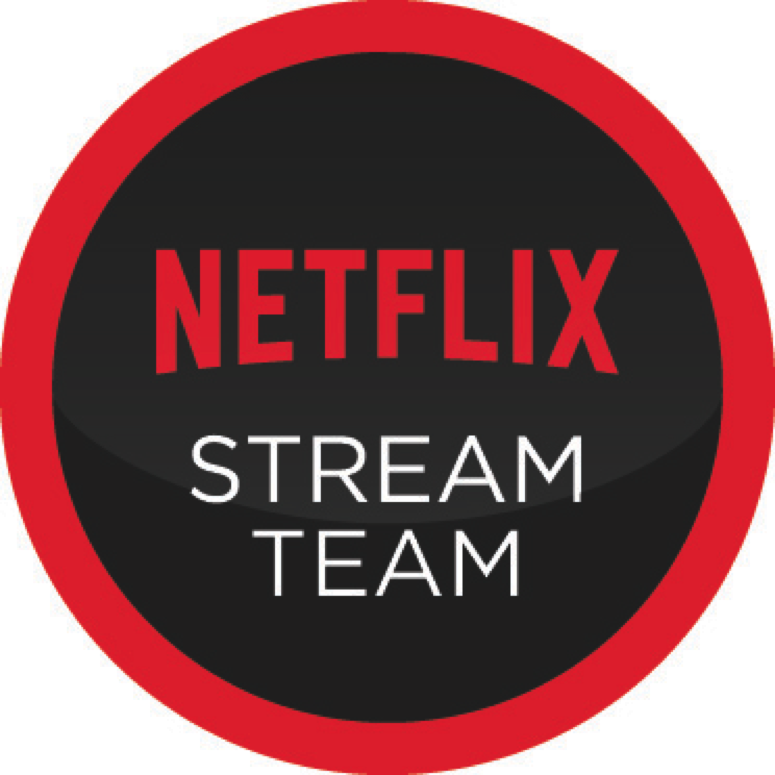 This post was written on behalf of Netflix as a part of their #StreamTeam program. All opinions expressed are solely my own. My ties have languished in the back of my closet, unceremoniously hanging from an all-purpose tie/belt rack waiting for their call up to the big leagues. Since I have been a stay at home dad, they’ve been on reserve for special occasions, only coming out for weddings, Sundays, and the rare funeral. Between the plaid flannels and multitudinous button downs, they may peek out from time to time, trying to catch a glimpse of light from the overhead 60 watt bulb fueled by a pull chain that clanks against the thin glass. That light sometimes makes them shine if not only for a moment when they might catch my eye. The shimmery silks and iridescent patterns of years gone by. You can tell a lot about a person just by their tie. It can be a statement about who you are and what you stand for. It can make you stand out or recede into a crowd. There’s just something about a tie that says professional. I used to watch my mom get my dad ready for a business trips. She would line his sport coats and suits from our second floor bannister like an army of businessmen without heads just waiting to be filled with a body. In each and every instance, she’d pull out his ties and hold them in her fist like a brightly mismatched colored octopus and she would walk back and forth measuring up their might like a matchmaker trying to find a suitor. I don’t know if it was my dad’s lack of sensibility around color or his inability to match patterns but my mom was good and explaining why each tie went with each set of pants, shirt, and shoe combination. Maybe it comes from the years of observation or just that artist’s understanding of pattern and color, but I’m pretty good and knowing when a tie just belongs with a shirt. But I understand, that not every man is that guy. You don't have your mom to tell you something doesn't match and you can't rely on your significant other all the time. 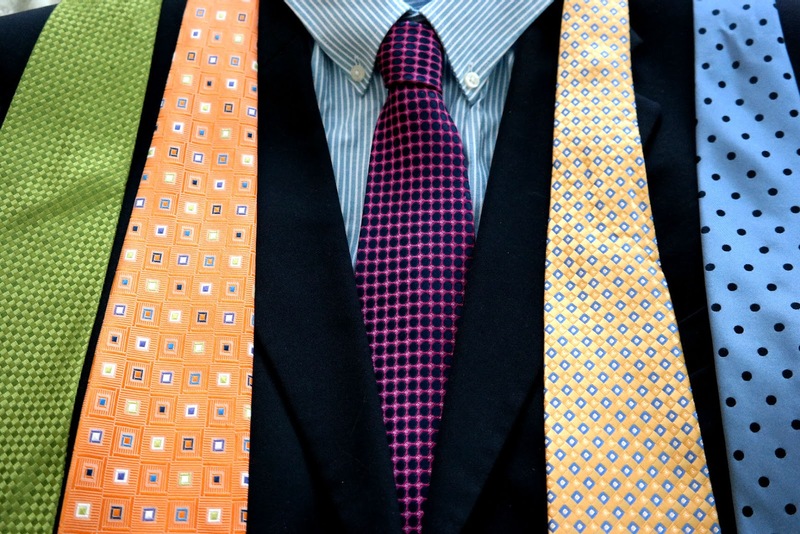 Your ability to match a tie with a shirt will say a lot about who you are as a person and what you are capable of doing. It’s the reason why in an interview, your tie may be saying I’m confident and capable but your shirt and tie combination may say that you dress like you did it in the dark. Who wants to take a chance on someone who can’t get things done within his own wardrobe? 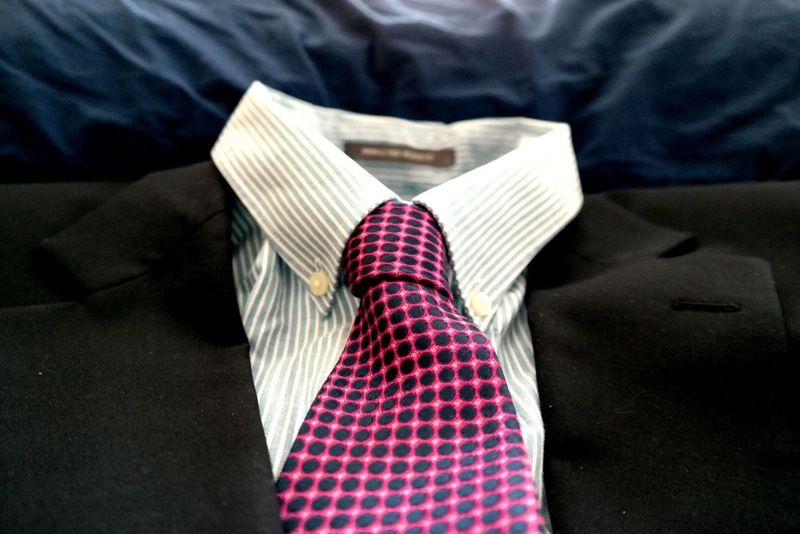 So if your mom isn’t around to tell you what to wear and you really have no idea what you are doing when you wonder if a striped shirt can go with a polka-dot tie, good thing there is a guide to help you on your journey. This is a sponsored post done in collaboration with Jacamo. I was compensated for this post and if you don't know how to match ties, you should use our advice. “There’s nothing to eat!” my kids will wail as they stand before a fully stocked pantry of after-school snacks. They could be standing in front of a wall of snacks and still say this the very same way we, as adults will look at our closet and see the same thing with our clothes. Sometimes, you just get tired of the same old thing. What about this? I’ll point to my go-to snack, hoping they forget about the ones they piled into their lunchboxes just the night before. “No. I don’t want that, I don’t like it.” she will say, turning up her nose and crossing her arms. 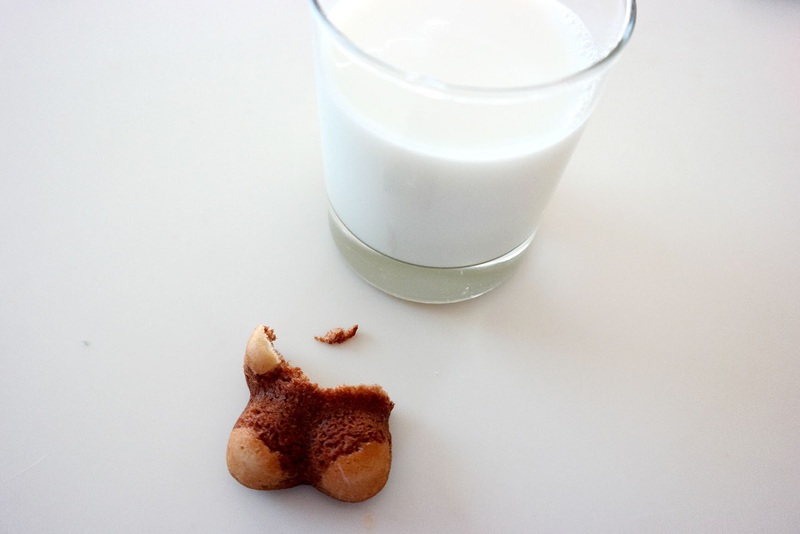 I knew that would happen because they came back from school untouched. I thought I could sneak one by her and present it as something new. It was worth a shot. “Okay, how about this?” I point to my secondary go-to snack, the ones they’ve like since they were just babies getting used to solid foods. “I’m TIRED of those, isn’t there anything new that’s good?” she sighs and sometimes falls to the floor, frustrated by my "narrow" selections. Apparently my snack game is weak and I need to bring them something new and exciting that they will look forward to at school and after school. I try in vain to convince them that they should take my offering knowing all the while that I wouldn't eat it either if I were them. And so, the dance begins to drag on, where I suggest a snack that I thought they would love forever only to find that it tragically has fallen out of favor. I may have had previously stood before endless possibilities in the grocery store trying to find something that I know they will eat only to get it home and find out that they’ve changed their minds about how they feel about it. If you see my scratching my head at the grocery store taking things down and then talking myself out of it after I read the labels, this is the reason why. “You USED to love this,” I’d say. 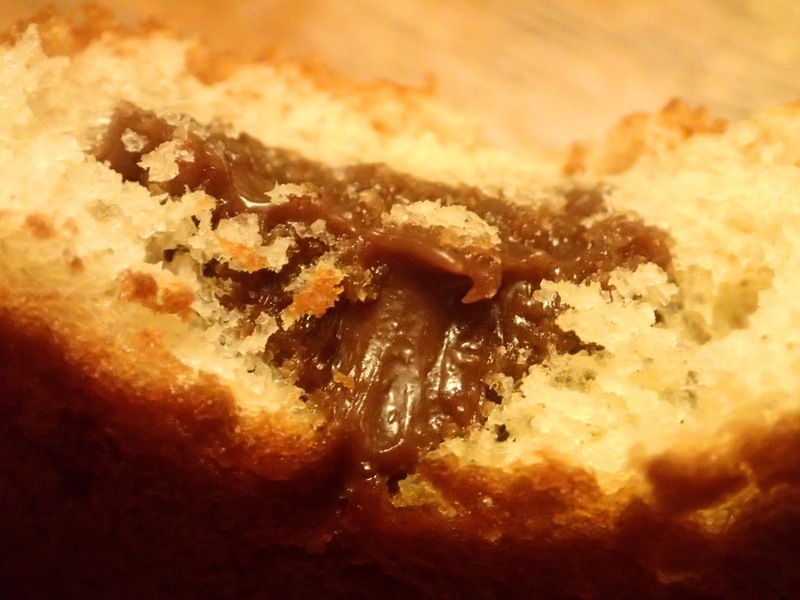 You DO love this, and you’re going to eat it. “ Yes. That usually goes over very well. The truth is, they are tired of the same old thing and that’s when parents need to give them a snack that says fun and nutritious. This is the moment that most parents relent. When asked if for the twentieth time they can have the sugary snack you normally keep for a rainy day. Suddenly, those popsicles in the freezer become fair game even though you know they aren’t good for them but you just are tired of the struggle. Struggle no more parents. I was that guy until I found Teddy Soft Bakes. Teddy Soft Bakes are wholesome snack that don’t contain all the artificial junk that other after-school snacks may have. 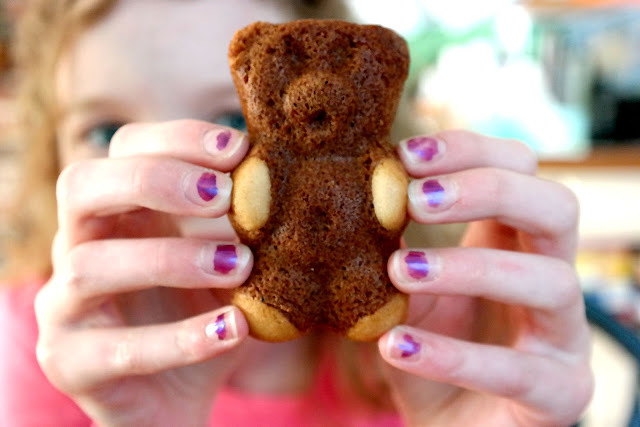 They are light-textured cakes in the shape of a Teddy Bear full of chocolate or vanilla filled centers. Just the presentation of the box had peaked the interest of my children. There was a box for the chocolate lover and the vanilla lover too. And they recognized that fun shaped figure that has spent his time in their lunchboxes for years. Everyone loves teddy bears right? Especially when they are chocolate and vanilla filled! Suddenly, I was the culinary hero making snacks great again one day at a time.When my kids started taking them in their lunches, kids in her class were assessing their own for possible trade opportunities.. 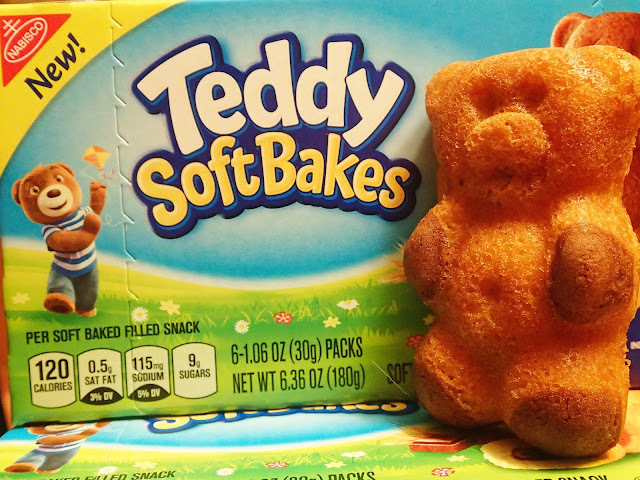 These Teddy Soft Bakes have their attention. Now, I just need to make sure I stock up and keep a steady supply on hand to ensure that snack time continues to be more bearable for me and them. **Given the difficult nature of capturing Navdy’s projected display on film, this picture is not fully representative of how Navdy’s display actually appears during use. My alarm went off much sooner than I expected and I fumbled in the dark reaching out for the electronic glow that mocked by feeble attempts to grasp it. My fingers groped across my nightstand until my fingertips made contact with the watch band. I felt the wood of the nightstand, air, then the lamp.. I had it for a minute but couldn't quite grasp the motor skills required to turn it off. I couldn't navigate in the dark. After what seemed like minutes but was probably only seconds those seemingly elongated moments seemed to stretch out. It seems to stretch when you alarm goes off and your significant other's does not. I managed to find the button to end the siren's song ushering me into early morning darkness. Methodically, I swung my legs over the side of the bed like an old man getting into a boat from a high dock and stood up listening to more cracks and groans than I expected, The warm sheets left me like an old snakeskin ready for it to become new. It was time to wake up and seize the day. Today was the day that I would blaze a new trail. Today, I would be returning to work for the first time in almost ten years. It was an adjustment for sure, waking up first, getting the coffee first, and saying goodbye first. 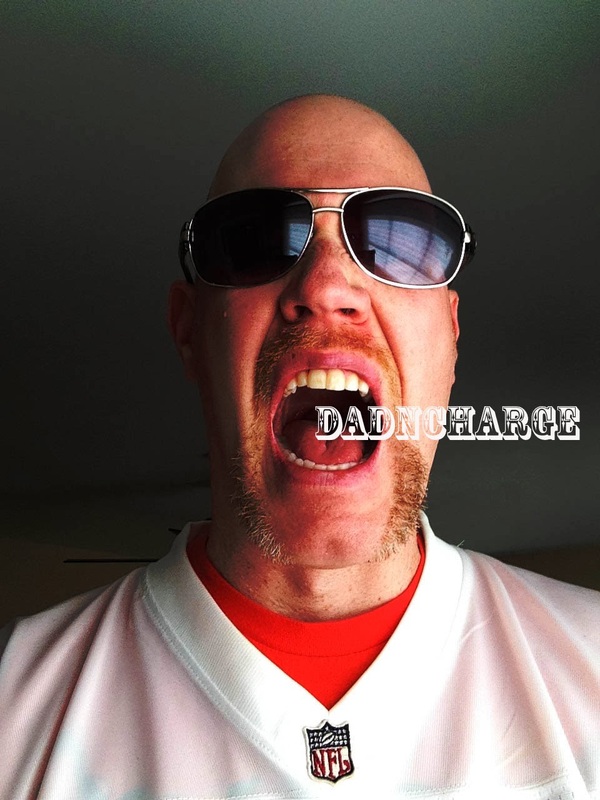 I suddenly experienced the goodbye hugs my wife would get everyday as she rushed out the door to work instead of the dismissive jump from the minivan as I waited for the kisses on my cheek that never came. I was in new territory and unfamiliar with how I should be feeling. There was a sense of excitement and of dread. I drank my morning coffee hoping the familiar would calm my nerves. Experiencing something unknown is the sort of scary that slowly creeps up on you. It's that same sensation you get when you travel to another place you've never been to before but you're not really sure how to get there. In times of uncertainty, we like to know just how our path is laid out. We want assurance that our way is clear and safe and that no matter how we get there, it's done safely. I needed to focus on the road ahead of me as a blazed the new trail. And so, as I prepared to make the drive to start something new, I used the one tool that consistently gets me where I want to go, a navigation system. The Navdy isn't your everyday navigation system though. 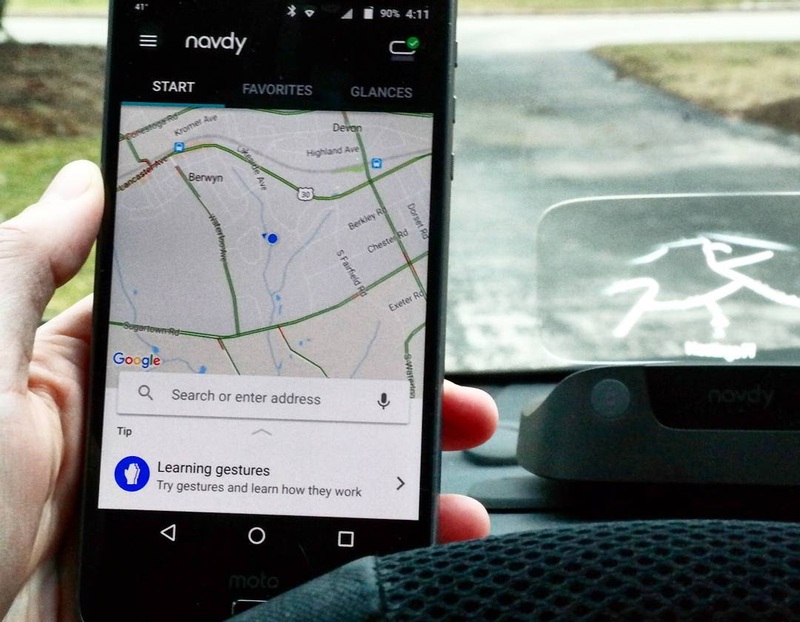 Navdy enables simple, gesture-based access to the phone functions drivers need most and projects everything to appear directly in their line of sight on the road ahead. No more looking down at your phone when a call comes in on your way to work. Just swiping your hand left or right lets Navdy know if you are accepting or rejecting the call. Put it through, and you will answer your phone right through the Navdy. 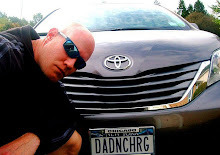 When we bought our minivan we were dead set against the extra money it would cost to put in a navigation system in 2011. Now, you can't find a car that doesn't have one. But with Navdy, it's different because it is plugged directly into your own car. You control Navdy through the free app on Google Play and Apple App Store. 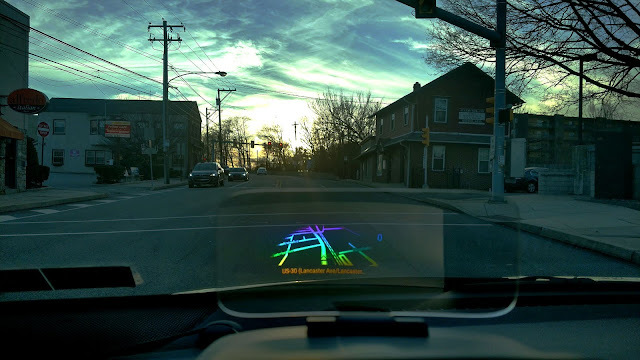 When you get into your car, Navdy automatically connects to your phone through Bluetooth. Navdy projects things like speed, navigation maps, make an receive calls, and read your texts by setting up Glances. It can even play the songs you have on your phone which you control with the use of a click-wheel that you mount on your steering wheel. And when it is time to shut it down, the Navdy unit detaches magnetically to the base for storage out of sight. The display showed up well in the dark as I headed to school and I followed Navdy's directions right to my own parking spot. Unfamiliar with the road, I kept a close watch on the display speedometer which now only showed me my speed, but based on the location, what the speed limit was on that road. That certainly helped when I was so focused on getting there that I didn't see the police car watching for speeders until I passed it. It helped me maintain the proper speed limit even when I didn't see a sign or know what the speed limit was all my GPS location. The first day I used it, I was headed home and events that were in my Google calendar showed up as reminders as well as an option to select to navigate to that location. All I had to do was select an address and Navdy pulled it up on my screen. But by far the best feature is that the Navdy will read the texts that are sent to you, giving you the option to respond, call, ignore the message, or let people know that you are driving and you're not able to respond by using the click wheel mounted on the steering wheel. Recently, Navdy inventors dropped the retail price to$499 or $28/month for 18 months at 0% financing, a small price to pay for the safety of everyone you care about in your cars. The Navdy, like me, is a trail blazer. It makes driving safer by keeping our eyes on the road where they belong and not down at our phones. 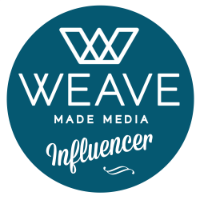 I for one am excited about where Navdy is going to take me and I know that getting there will be half the fun.